Donors to the University of Louisiana at Lafayette were recognized by the UL Lafayette Foundation during a reception Tuesday night. Each year, the Foundation gets the opportunity to honor donors of new endowments. This year’s honorees helped establish 21 endowments including professorships, scholarships and faculty development funds. Each endowment is represented with a plaque in the Distinguished Donor Hall of Honor in Martin Hall. This year’s additions bring the total number of plaques in the Hall to 299. Each plaque includes the names of the donors and represents a contribution of $50,000 or more. “	We want to thank these donors who are making a lasting impact on our university,” said Julie Bolton Falgout, executive director of the Foundation. The Distinguished Donor Hall of Honor recognizes private gifts given to the university. These gifts generate funds in perpetuity. The principal from the endowment remains in a perpetual fund that is invested while earned income is distributed for student scholarships, professor salaries, research supplements or other designated programs. To date, the Foundation ’s endowment is valued at more than $103 million with more than 920 endowed funds. Opportunities available through the Board of Regents Support Fund allows for funds raised to be matched by the state for endowed chairs and professorships. As as example, for every $600,000 UL Lafayette receives for an endowed chair, the state matches $400,000, bringing each chair to $1 million. 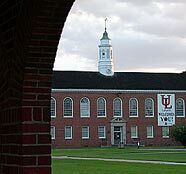 Likewise for every $60,000 UL Lafayette receives for a professorship, the state provides a $40,000 match, bringing each professorship to $100,000. The Board of Regents offers a similar program for first-generation endowed scholarships. • UL Lafayette Alumni Association Endowed Scholarships.